Have you ever read one of those articles titled something like, “Proven Strategies for Writing a Book in One Month” and thought — “No Way?” I must admit that I have always been skeptical of this concept. But using my nonfiction book writing process, which I outlined in an article on this blog last month, I started my latest book on September 17th. It is scheduled for delivery on October 19th. Granted, it is not a 300-page text-rich reference book or professional nonfiction publication like I would normally write. Still, I believe it is a solid nonfiction resource book. 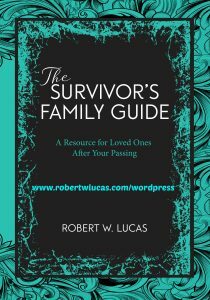 The title is The Survivor’s Family Guide: A Resource for Your Loved Ones After Your Passing. It ended up being 210 pages of tables, checklists, and other useful resources that a family member can reference following the death of a loved one. By providing a single place for people to gather thoughts, last wishes, and personal and financial data, I hope to simplify and reduce some of the anxiety of the estate handling process for survivors. Start with a viable idea. I first got the book idea when a friend of mine and his wife had to assume the role of executors following the death of a friend. The stories that they related about problems they encountered in finding all the information and documentation needed to settle the estate struck a chord with me. I have a 100 year-old mother who lives with me and my wife and I realized that there are things I probably need to better organize for when she passes — or for that matter when my wife and I pass. Do initial research. With the idea in mind, I began a research initiative on major book selling sites and in local bookstores to see if similar resources exist. I found that there were at least three possible competitors, but in looking at their table of contents and format, I realized that my idea seemed more user-friendly and comprehensive. Encouraged by my findings, I ran the idea past a number of friends and relatives whose opinions I value. They were all very enthusiastic and said they wanted a copy of the book. Some of these people are professional writers, one is a publisher, and another an accountant, so I believed that I was on to something good. Create a working outline. My next step was to create a working outline and draft out possible chapter headers and sub-headers that might fall into each. I then set up a sticky note version of the outline on my office wall to keep my concept visual as I wrote. Make content flow. My idea for content presentation was to fill the book with tables of various types of information and along with fill-in-the-blank areas in various columns. This added a visual element to its functionality. Set a deadline. Deadlines are crucial for serious writers because it provides a target on which to focus. My goal was to have the writing completed within thirty days and start the next phase of the project. Have a writing schedule. I started writing on Saturday, September 17th at 2:00 p.m. I know this because I wrote it on my calendar. My goal was to create at least 10-15 pages a day, since I was also blogging and working on revision of my textbook. I exceeded that goal and finished ahead of schedule. Edit when you finish. I wrote the final page on Wednesday, October 5th at 5:30. Again, I wrote that on my calendar with the intention of writing this article later. As soon as I stopped writing, I went into editing mode and spent the next three days revising, adding, deleting and repositioning content. I used quite a few tables with columns of information, as originally planned. However, after reading the material numerous times, I decided to eliminate most of them in favor of checklists and fill in the blank formats. There were two reasons for this decision. The first was that the sheer number of tables seemed repetitive. The second was that, even though a fill-in page format added page count and cost to the book, it allowed more room for notes and information. It also provided a bit more flexibility in the way I could address various topic areas. The result was a more visually aesthetic and reader-friendly format. Use a beta reader. I always ask friends and family members to review my manuscripts and provide critical feedback. After all, each of them has a different background and perspective from mine. Just like my ultimate readers, the beta readers will be looking at what I create through their eyes and preferences, not mine. Such candid feedback is crucial if you are going to write a successful book. Hire a professional editor. The final step in the creation process was to get the content over to a professional editor whom I trust. Because the book is not heavy on text, this only took two days. Begin the production cycle. While the editor worked her professional magic on the book, I began the process of getting an ISBN and requesting a Library Control Number from the Library of Congress. This took less than a day. At which time I contacted a designer that I have worked with before. I asked her to start the design of my front and back cover and spine. This included created a QR code and bar code for the back cover. As soon as I received the corrected content from my editor, I again reached out to the designer with the final manuscript and asked her to begin interior design. She’d already completed the cover design. Luckily, because she is a friend and talented professional, she fast-tracked my project and had it completed by October 9th. I then sent it off to a printer that I have used for previous projects. I call the type of book I’ve just completed a “quick hit” book. They are not as complex, do not require as much writing time, and still provide useful information and resources to readers. They are also evergreen, meaning that their content is not dated and is easily updated, while continuing to provide income for years to come. If you get an idea for such a book, I encourage you to move forward to explore the feasibility of writing one. Having more publications increases your potential for ongoing revenue flow. Not all of your books will be successful but, by generating a steady stream of content, you enhance your personal and professional brand if you promote them well. You also generate material that potentially serves as a source for derivative products or services as a nonfiction writer. For example, a series of self-help books, blog article , swag (e.g. cups, shirts, hats, toys, and similar products) or speaking engagements that help make money, promote your books and gain visibility. For additional ideas on how to use the nonfiction book writing process I’ve outlined in this article, check out similar articles on this blog. 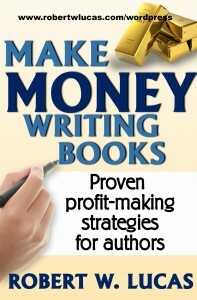 Also get a copy of Make Money Writing Books: Proven Profit Making Strategies for Authors to gain insights into ways to maximize earning potential and enhance your personal and professional brand. Do you have a tip or strategy that you use for writing books that you would like to share with readers? Please add it below. Bob Lucas has been a trainer, presenter and adult educator for over four decades. He who has written hundreds of articles on training, writing, self-publishing and workplace learning skills and issues. He is also an award-winning author who has written thirty-seven books on topics such as, writing, relationships, customer service, brain based learning and creative training strategies, interpersonal communication, diversity, and supervisory skills. Additionally, he has contributed articles, chapters and activities to eighteen compilation books. Bob retired from the U.S. Marine Corps in 1991 after twenty-two years of active and reserve service. This entry was posted in nonfiction book writing, Success tips for authors, writing a nonfiction book and tagged how to write a nonfiction book, the nonfiction book writing process, writing a nonfiction book. Bookmark the permalink.